Marie Simon looks at her property where a coyote emerged on Wednesday and attacked her. 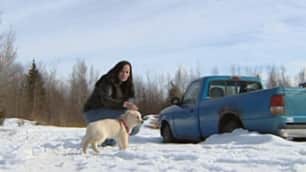 (CBC)A New Brunswick woman who wrestled with a coyote Wednesday was still shaken hou rs afterwards but managed to walk away needing only a tetanus shot and a bandage.Marie Simon of Saint-Charles, near Richibucto, said she went into her backyard about 2:30 a.m. to let her puppy Sampson out. “He started pulling to go back in the house,” Simon said. “[I] thought it was just a puppy thing, and I heard a snarl and I turned around and I thought it was just a dog — and ended up it was coming right at [me]. All I could see was teeth.” Simon threw the puppy more than three metres away to protect him, then found herself under attack by the coyote. “It started trying to bite at me and bite at me and … I just covered my head with both my hands like that and swinging off punches when I could,” she said in an interview, with clumps of her hair still visible in the snow.